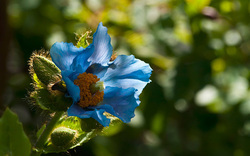 Most of our perennials are listed as Alaska Grown or AKG unless otherwise labelled. AKG means these perennials have been wintered over at least one season. 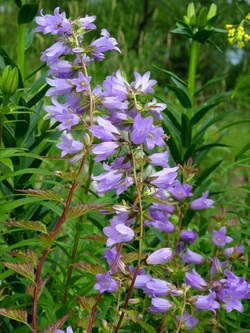 Similar in coloration and growth to 'Cherry Bells', this lovely bellflower comes from England. 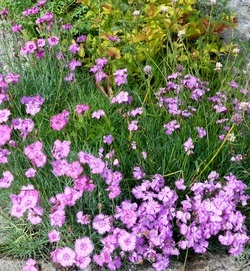 Dianthus gratianopolitanus - Alpine Pinks. Bleeding Hearts have lovely arching stems with pink heart-shaped flowers in late spring-early summer. 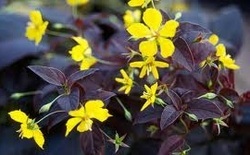 Pick off spent flowers to prevent seed set and you will enjoy a longer bloom period. Full sun to part shade. Moist, humusy soil, well-drained. 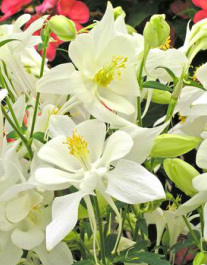 Do not plant under drip line or may freeze out! Beautiful foliage. 30 “ x 30”. 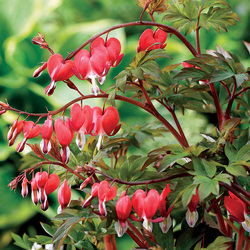 A classic Bleeding Heart with deep flushed new growth and reddish flower stems dripping with red and white hearts. For those of you who prefer less pink, this one's for you!